It’s no secret that I love wine. I love everything about it – the aromas, the flavors, the adventure of learning about my palate and pairing food with wine… and I especially love visiting the great wine regions of the world. There’s always something new to experience in the world of wine. Hubby and I are turning into quite the wine tourists, with last year’s trip to California and this year’s travels in Provence and then Burgundy. Burgundy is divided into several sub-regions, including Chablis (mmmmm! ), the Cote de Nuits, the Cote de Beaune, and Macon. Hubby and I stayed outside of Beaune and spent the bulk of our time in the nearby villages, tasting in Pommard and Puligny-Montrachet. If you’re a winey, those names are probably familiar to you. They were to me – and there was much squealing when we rolled into Pommard – but I learned something new about the wines of each village while I was tasting there. The Burgundian villages and vineyards were gorgeous… and the best way to see them was by bike, of course! We rented bikes in Beaune and cruised out for a half-day of sightseeing. I was completely blown away by the incredibly picturesque little villages dotting the countryside. We rolled by ancient churches and gorgeous castles and through acres of rolling vines. This trip was a pilgrimmage of sorts for me. I felt like I was at the heart of the wine world, in the place where the magic really happens. And as much as I look forward to my wine club shipments from California, no wine will ever replace Burgundy for me. Especially now that I’ve been there and seen the countryside with my own eyes. I can’t wait to go back. Until then… drink up! View from the terrace of our B&B in Vaison-la-Romaine, Provence. Provence has a few standout wine regions, including Chateaunneuf-du-Pape and the Cotes du Rhone. During our stay in Provence, hubby and I knew we wanted to see the Cotes du Rhone and try some of the region’s wines. We’re both fans of the reds, and I am a big proponent of rose wines (they’re misunderstood and they need a friend) – and the Rhone does roses particularly well. As it happens, not only does the Cotes du Rhone produce magnificent wines (at a great value), but it’s also insanely charming. Vineyards of the Cotes du Rhone. We tasted some standout Rhone reds at Domaine de Mourchon, a winery that is blending the best new technology with the most delicious traditions. Grapes ripening on a trellis at Domaine de Mourchon. Hillside vineyards at Domaine de Mourchon. More time-standing-still charm in Le Crestet. Col de la Chaine, a scenic overlook with a view of the Dentelles. Traveling the Cotes du Rhone wine road was quite an experience! I’ve always liked the Rhone wines – great drinking wines for a good value – but now that I’ve seen their home terroir, I think I’ll be seeking them out much more. Here are a few final shots of hubby’s and my travels through Napa and Sonoma. It was an amazing trip, and we hope to return sooner rather than later. These grapes outside the Grgich Hills winery look pretty healthy, don’t they? Grgich Hills wines aging in French Oak barrels… soon to be consumed by hubby, no doubt! This was his favorite of the wineries we visited all week. Grapes being crushed at Cakebread. I’m not sure hubby and I were supposed to be hanging around this area, but nobody told us to leave, and it was extremely cool to watch. Grapes growing on a trellis. I’m pretty sure this is what Heaven looks like. Rubicon Estate. This was another of hubby’s particular favorites. This is Cliff Lede Winery. They pride themselves on their Cabernet Sauvignon, which was delicious… but they were also making the best (and least expensive!) Sauvignon Blanc that I tasted all week. We brought three bottles of it home. Clearly, I’m not the only one who likes Cliff Lede Sauvignon Blanc. It was served at a White House luncheon in 2006. Bill Clinton has served Cliff Lede wines as well, and wrote Cliff a nice letter about how much he enjoyed the wine. Cliff Lede had a beautiful tasting room, too. I pretty much wanted to move in there. I mean… it’s a place where people love both Sauvignon Blanc and Canada! My kind of people! Finally – the long anticipated visit to Domaine Carneros! This was what I was most looking forward to on the trip, and it didn’t disappoint. Unfortuntately, the lighting wasn’t great below ground (duh), but they had a wonderful collection of vintage champagne-making equipment, as well as views into the cellars where their own bottles of sparkling wine were being turned. We tasted some amazing sparklers there, including La Reve (“The Dream”), a magnificent brut rose, and their standard brut (which is supposed to be widely available, so we didn’t buy it, but now I can’t find it in NoVA! If anyone knows who may carry it…). Domaine Carneros also does great Pinot Noir, which hubby especially loves. We joined the wine club, so now every two months we get a bottle of red and a bottle of bubbles. Works for me! Oh, my goodness, I want it all! Hubby and I had a fabulous time in California. San Francisco was a beautiful city, and the wine country was everything I had imagined it to be – and more! I’m sure we will be going back, but in the meantime, we have plenty of amazing wine that we brought home, so we can continue our California dreaming for quite some time. Stay tuned for reviews of some of our souvenir wines in future “Wine Notes” posts! Cyrus Restaurant was our big splurge, because try as we might, hubby and I just couldn’t get a table at The French Laundry. While pouring over the Burgundy Bible to plan our restuarants, we discovered that Cyrus had the same food rating – an astronomical 29 – as The French Laundry. We decided that just because we had bad luck trying to get into The French Laundry didn’t mean that we didn’t deserve a dinner we would remember for the rest of our lives, and man alive, will we remember this. From the moment you walk into Cyrus, you know that you are in a very special place. The restaurant was incredibly elegant, with dim lighting (as a result, I must apologize for my photography) and a staff of waiters that made you feel as if you were the only table that mattered. We ordered the tasting menu, sat back, and prepared to be amazed. And amazed we were – the quality of the food was outstanding, the presentation was spectacular without being pretentious, and the dishes were creative and sumptuous. Cyrus was just insanely good. Each course was intelligently planned and presented, and paired with its perfect wine – some local, some Old World. They gave us a copy of our menu to take home and dream about the meal we had, and I’ll be dreaming about it for quite some time. Lynmar Estate Winery. We were actually on our way to a different winery when the sign caught my eye and I shouted out “Pull over here!” We never made it to the winery we had originally planned, but I’m not sorry, because Lynmar was a treasure. 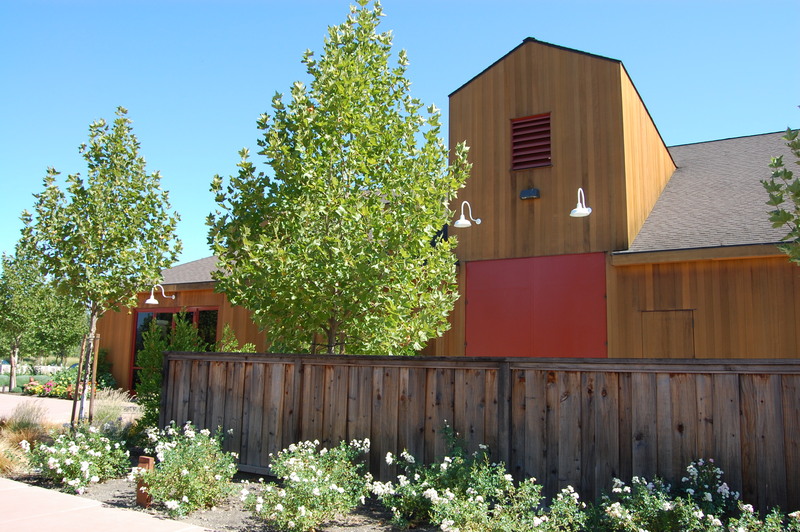 It’s a tiny winery that does most of its sales through its website and right in the tasting room. The wines were some of the best that we tasted all week. Another Sonoma winery I love is La Crema. My parents introduced me to La Crema wines through the widely-available Sonoma Coast Chardonnay, which I love. (In fact, introducing me to La Crema is on my short list of things for which I’m most grateful to my parents – right under Giving Me Life and Paying For Cornell. Well, Taking Me On Awesome Vacations is probably ranked higher than La Crema too… but as you can see, I’m pretty grateful to my parents for La Crema.) Hubby loves the wine too, so we paid a visit to the tasting room in Healdsburg, where we got to try some of the fantastic wines that result from winemaker Melissa Stackhouse’s playing around. Do I even need to tell you that we joined the wine club? Or could you have guessed? So! Many! Choices! What’s a messy Libra to do? While in Napa, one absolutely must visit Robert Mondavi winery. Sure, you may think – as I did – that you already know what Mondavi wines taste like and you’re in Napa to experience something new. But you still have to go to Mondavi, first and foremost, to pay your respects. Mondavi was a wine industry giant, respected all over the world – even in France! – and responsible in many ways for making California wines what they are today. The winery itself is gorgeous and the tour is fascinating. And there’s also the small matter of… well, let’s just say that the wines you taste after the tour are not your run-of-the-mill Woodbridge from the grocery store. They serve you their absolute best stuff, and it’s world’s away from mass produced. I left Mondavi’s winery with a new respect for the man as a wine pioneer – and I had already read Harvests of Joy, so I did know how important his contribution was – and a newfound taste for his wines. After the incredibly interesting tour, we tasted three outstanding wines and had a parmesan cracker, for which the winery was kind enough to give everyone a copy of the recipe! Since recipes are my favorite kinds of souvenir, stay tuned for those crackers to make an appearance before long. Robert Mondavi winery was a revelation. My parents had been there and highly recommended it, so I did have some elevated expectations. And I would have gone anyway, simply because Mondavi himself was such an important personality that I didn’t feel a trip to Napa would be complete without visiting his winery. But the wines we tasted there were so special that I left the winery with a new admiration, not just for the history of the place – which I already respected – but for what they’re doing in the here and now. It really is intoxicating.